I'm calling it, now. One day, far in the future, when certain cynical games historians look back on this period at Nintendo, some wiseass is going to write this sentence: "Nintendo's obsession with their bottom line became such a singular, blinding pursuit that they even released New Super Mario Bros 2, a sequel in a sequel series to a sequel series, wherein Mario, like his corporate overlords, greedily focused on collecting as much gold as possible." That sentence is inevitable. Hell, they might have already written it over at IGN, as far as I know. Why the outcry? Because this game commits a pretty significant crime against the Mario franchise: It's the first Mario 2D platformer (okay, since the Japanese Super Mario 2) that looks and feels downright lazy. It shamelessly reuses assets from the original New Super Mario Bros., a dusty, old game that came out way back in 2006. And not just here and there. This whole game looks, feels and - in particular - sounds like a colossal rerun. It's demoralizing, even to fans of the original DS game, because everything looks like a cheap cash-in - an impression the coin collecting gimmick just drives to the bank. Here's a game designed and marketed specifically for Nintendo's bottom line. So sharpen your knives, kids. It's time to cut Mario into Italian sausage. No, we're not going to do that, because I enjoyed New Super Mario Bros 2, for the most part. Over 25 years and the Mario backlash still isn't quite ready to begin. So, kill your idols some other day, grumpy game reviewers. This Mario game may not compete with the best in the series, but that doesn't automatically make it a failure. The reports of Mario's death have been greatly exaggerated. To start, can we at least agree that handheld Mario games have never quite lived up to the home console versions? The Super Mario Land games have many positive qualities, for sure, but they don't pop up on many Greatest Games of All Time lists beside their venerated brethren. And, granted, the original New Super Mario Bros on DS was something of a revelation because it'd been so long since Nintendo gave us a 2D style Mario platformer, but as a full-blown entry in the legendary Mario series it still lacks in a few areas. It's too easy, for a start, especially in comparison to some of the crushing gameplay in the 80s versions. It also inaugurated the washed-out, artless look that typifies the NSMB series. Not to mention the mediocre music. But that stuff seemed like small potatoes when compared to the triumphant return of Mario. Still, I'm unsure you'll find many people who'll agree that the original NSMB improves on the standard set by Super Mario World. Heck, just compare it to the packed-with-ideas Wii version and you'll taste the vanilla in your mouth. So that's the trend. The handhelds have always been more Luigi than Mario. They never quite live up to the reputations of their big brothers. Maybe that's charitable, because there's no technical reason the handhelds can't be as good as the home versions. But I'm just pointing out the pattern. If you ignore the console versions and simply compare NSMB2 to the other Mario handheld adventures, it hits at about the series average. Maybe a bit below. That's not good news, but it doesn't automatically spell doom for Mario. If Super Mario Land didn't kill the plumber off, this game won't either. That said, as a straight Mario platformer New Super Mario Bros 2 has some problems. It's probably the easiest Mario game since the Game Boy versions, a pretty shocking bit of news. Beyond the simplistic platforming and the disappointment that Bowser hangs out in measly World 6 nowadays, the Koopalings seem to be merely punching the clock. Where's the old fighting spirit, guys? I'm not so schizophrenic that I find myself talking to a video game character very often, but I caught myself saying out loud, "Oh, come on, Wendy, you used to give me more trouble than that." From World 1-1 to Bowser's Castle my Mario skills never felt particularly challenged. Of the handful of deaths I incurred, most of them came from recklessness in the pursuit of coinage rather than tricky platforming or tough, creative boss design. That's certainly disappointing. It does beg a question, though: How hard should Mario games be, anyway? Those of us who grew up playing these games have developed some fairly ridiculous platforming skills over the years. Should new games in the series be made for old veterans like us, who can bounce through the original World 1-1 with our eyes closed, or should it be accessible to newcomers? Hard question to answer. Nintendo's strategy seems to be to offer secret worlds and secondary modes for veterans while making the main game a bit easier for rookies. They get mixed feelings from me about that, because the secret worlds aren't quite difficult enough and, well, because I'm an old, entitled Mario gamer at this point, I guess. I respect that Mario should be accessible to kids, but if I'm going to fork over my money, I want a game that takes more than a couple of play sessions to beat. That's no joke - I finished the main game in two sessions. And not in some kind of sick Mountain Dew-inspired Mario marathon, either. A couple nights of gaming and it's all over. All that said, I still think NSMB2 deserves a positive score. Why? It's not simply charity or nostalgia driving that. I really do feel this game does some bold, interesting things for Mario, with the coin pursuit standing out most particularly. I love this aspect of the game and would be happy to see it expanded at some point, either through DLC or perhaps even a full-blown spin-off series. Nintendo has taken such a simple idea, to focus the player's attention back on the lowly gold coin, and have come up with a slightly different way to play Mario. Personally, I've always been ambivalent to the coins in Mario games. Yeah, 100 of them nets you a free man, but I'm not going to hit every block on the map in pursuit of that. Better to learn the lay of the land and get really good at the actual platforming so you never have to use that extra man. But, here, the extra lives are entirely superfluous - bordering on the deliberately comical. Put your Grand Theft Autos and Call of Dutys aside: Life has never been cheaper than in NSMB2. You still get a 1up for every 100 coins, but the game otherwise seems to take place in the Land of Runaway Inflation. There're gold coins everywhere you look. You come across enough gold to satisfy Mario, Wario, Scrooge McDuck and every hip-hop star from 2001 to the present. Some players might feel this mortally wounds the game by removing, in one swing of the axe, both the motivation to collect coins and all penalties for failure, but I found myself collecting coins just for the sake of it, simply because they were hidden in interesting ways. Could there be coins up here, above the top of the screen? Jackpot! How about in this corner. Oh… I died. Time to use one of my hundreds of lives to try again. Along with that, the hunt for secrets gets pretty tasty after you search for a while. Ever since we found that first 1up mushroom, we've known to look for secrets in Mario games. It's just a part of the formula at this point. But New Super Mario Bros 2 might be the most secret-filled game in the series, really challenging the gamer to search every corner of every map. A lot of them are harder to find than in an average Mario, too. I can imagine a situation where the tedium of hopping all over the map turned the coin hunt into a colossal grind, but that's not my experience, here. And, with lives cheaper than ever, I took more risks than usual, which was oftentimes rewarding. This can be fun in the typical Mario way. Joyous, even. Can I get a round of applause for Gold Mario, too? That's a classic power up if I've ever seen one. I'm sort of operating, in this particular review, as if you already know a bit about the game. This is a Nintendo site and we're talking about Mario, after all. Who the heck requires a point-by-point explanation of this stuff? 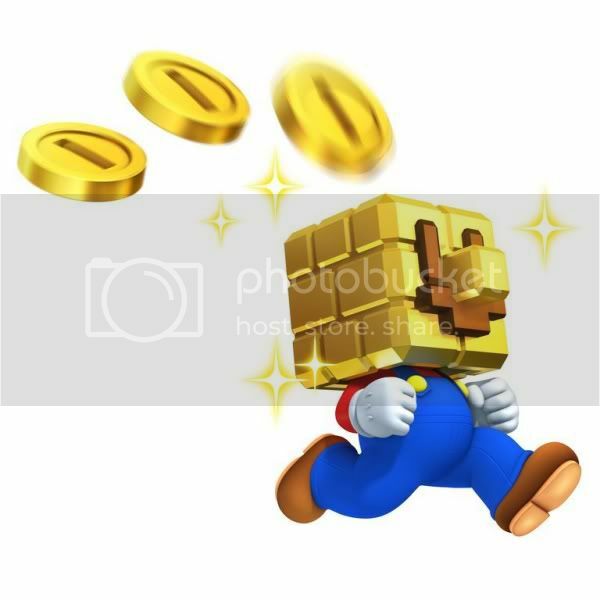 But in case you've missed it, in NSMB2 Mario can collect a gold fire flower that turns him to gold, alloying him (sorry) to shoot special gold fireballs that have the Midas touch. 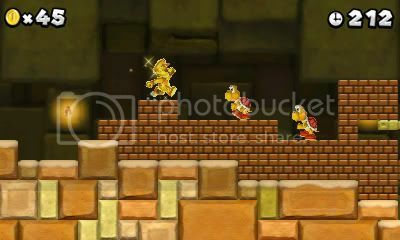 Yep, this power up turns certain objects to gold and enables you to chain jump enemies all the way to the bank. Not only does this allow Mario to boost his coin count, it's got a nasty blast radius and allows you to unlock secret areas by turning standard brick blocks into coins. It's cleverly implemented, fun to use and I can easily see it returning in future Mario games. I already like it more than the Flying Squirrel suit from the Wii U version, which I recently got to test drive. But, why bother with all these coins in the first place? The stated goal of collecting a million coins apparently gets you nothing special. (Transparency: I haven't gotten there, yet, but I'm on my way.) I'd argue that it works because it's nothing more than a fun challenge. An achievement, if you will. For many people, that'll destroy the whole point. Why work toward a goal that gives you no reward? I get where they're coming from, and understand how it could affect the appeal of coin-collecting for some players, but personally I feel, if the search for coins is fun enough, it doesn't matter what the MacGuffin is that compels me to do it. It's a bit like Peach, herself. I don't play these Mario games because I'm particularly interested in rescuing Peach for the 37th time. Rescuing the princess is simply an excuse for the game to exist. You play these games for the fun of the journey, not the reward when you get there. Same goes for the coin collection - a million coins is just an arbitrary goal that enables the fun of mastering the levels. But, still, Nintendo could have given out a better reward for all the work players are going to put into the game. Even something relatively easy to code, like letting you play as Wario, would make the Million Coin March easier to get behind. That said, I applaud Nintendo for not turning this into some sort of late-90's style Collect-A-Thon. It could easily have gone that way and I'm grateful it doesn't. Maybe this isn't a perfect Mario handheld game, but it can nestle somewhere in the middle of the pack without doing any significant damage to the series. The Big N might be stretching their audience's patience a bit with all these old assets, but it's still Mario and there's still plenty of fun to be had, even if it underperforms our expectations for the most important franchise in video game history. Did I just call that a secondary mode? Maybe that's not accurate after all. Maybe that's like dismissing multiplayer in a Halo review. A lot of care seems to have gone into Coin Rush, so how could I simply dismiss it? Am I maybe being a bit close-minded about what Mario ought to be? A new feature here, Coin Rush presents you with three random levels, challenging you to collect as many coins as possible against a shortened timer. This'll really put your 25 years of Mario skills to the test. Remember all those bland, boring levels from the main game? Drop those into Coin Rush and the genius of their design begins to fade into view. The standard platforming may have seemed relatively simple, but that's because a lot of these levels seem to have been optimized for speed running and coin collection in this mode. Take a random example - level 1-A, let's say - and start to run it against the clock. What I found, as I explored the level more closely, is a finely tuned coin collecting machine where every second counts. I'm not kidding - I've got this one down just about to the second, and my blitz through it includes backtracking, alternate routes, a number of secrets, 3 hidden gold mushrooms, two gold turtles that chain enemy hits for big points, and a number of other coin collecting set pieces that I had to work out by tackling the level over and over again. These features aren't necessary in the main game, but they're the lifeblood of Coin Rush. 1-A didn't stand out when I was on my way to rescue Peach - sort of boring, to be honest - but it's positively exhilarating to run that level, now. Oh, man. Could every level be like this? I've got to try them all! This has done something for me that no game since SMB3 has done: It's transformed me as a Mario player. Look, I've always been pretty good at Mario, but I'm not one of those speedrunners you see on YouTube. I don't play these games because I want to bounce through the whole level at the top of the screen or hop endlessly on Bullet Bills for a ton of 1ups I don't actually need. What's the point of all that? But Coin Rush suddenly makes that sort of speed running appealing and accessible to a player like me. There's suddenly a reason to explore and learn every pixel of a level and then put your Mario skills through the gauntlet. Let's not underplay Coin Rush. Here's a radical innovation for Mario. It's sort of a cartoon funhouse mirror that takes the plain-looking main game and transforms it into a movie star. It might not solve all the problems I have with the main game, but it certainly distinguishes it from the rest of the Mario catalog. Coin Rush alone justifies this game's existence. In fact, I'd love to see it spun off into its own series. Coin collecting. Who'd have thought? I'd say NSMB2 can sit comfortably with Super Mario Bros 2 (USA) and Super Mario Land as part of the Weird Mario Games Trifecta. I suspect it will stand as a cult classic, at the very least. I also suspect it will always have a somewhat damaged reputation, mostly because of the reused assets from NSMB. But let's not mistake it for a bad game. BLAAAAAARGH! COIN RUSH! I HAVE THE COIN RUSH RIGHT IN MY EYES! I SEE GOLD COINS EVERYWHERE I LOOK! JUMP JUMP MARIO YOU FATTY FAT SLOWPOKE! CHAIN THOSE GOLDEN GOOMBAS FOR ALL THE MONEY MONEY MONEY IN THE MUSHROOM KINGDOM! TAKE THAT BOWSER I'M THE KING KOOPA NOW! 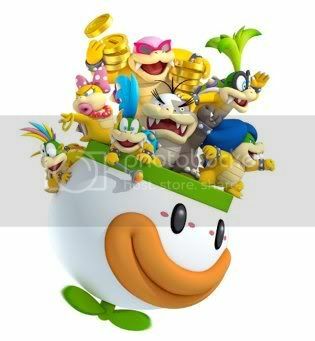 THE KOOPA WHOOPA IN A KOOPA STOOPA! IN YOUR FACE! IN YOUR FACE! COINS! COINS! I EAT BREATHE AND SLEEP PRECIOUS COINS COINS COINS!!!AHAHAHAJFOIEWUJHFIHIOVHWIMVOEPJTINGFOROWIDROMV-SDFOJONEYLDKSFJONOWONOPOIOUKDSFLJQWDOS!!!!!11!!1111!!!!!! Wait, wait, wait… Get your wits about you, Kris. Here's the deal. While Coin Rush alone justifies the existence of NSMB2, it's not perfectly implemented. To start, it comes with a salary cap. You can only collect up to 30,000 coins in a single run. Once you get above that, the system doesn't count any additional coins. Now, you'll have to work incredibly hard to hit that ceiling, no question. That's one heck of an accomplishment. As of right now, no one on Negative World has hit it, yet. But the whole idea of a coin cap is flawed. Did any of the classic score-based games, from Pac-Man to Galaga, ever have a score cap? (Or at least one that could easily be hit by someone other than Billy Mitchell?) Of course they didn't. Those games enabled high score competitions by design. That's how score-based games are supposed to work, and there's no good reason for Nintendo to monkey around with that expectation, now. I'm also a bit perturbed by the lack of leaderboards. That's not usually something I'd get worked up about, but Coin Rush really calls for it. Even if it was optional or only based on your friends list, a simple way to compare your scores would be extremely welcome. There's also an obvious issue with the randomization of levels. Your final score depends, to some degree, on which levels you get. Some are easier than others to get big money, so a single, unified high score is going to favor the players who focus on those particular levels. Instead of randomization, Coin Rush should have offered a wider selection of packs to choose from, each with three specific levels. That way, you could more easily compare apples to apples and oranges to oranges when looking at a friend's scores. Maybe keep the randomized pack as its own thing - because it's pretty fun not knowing what you're going to get - but a more structured experience in pursuit of high scores should have been obvious - so obvious that it's a misstep to leave it out. Also - and this is becoming a pet peeve of mine - this focus on Street Passing with the Coin Rush scores... Look, I'm sure Street Pass is kick-awesome if you're a dude who rides the Kyoto subway to work every day. You probably pass a handful of peeps rockin' the 3DS big time styley. But there are tons of areas, including where I live, where you just don't encounter other people carrying their system around. I carried my 3DS around for a year and got a whopping 7 Street Passes, most of them from a single outing to a video game store. So any Street Pass functionality is useless to a guy like me. And even if I did pass fellow gamers all the time, the very idea that I would be more interested in sharing my high score with some random stranger than with my actual friends... that's completely foolish. I'm going to say it. Street Pass is bunk. Nintendo should stop focusing their energy there and do the obvious thing and develop actual online modes that everyone could use. 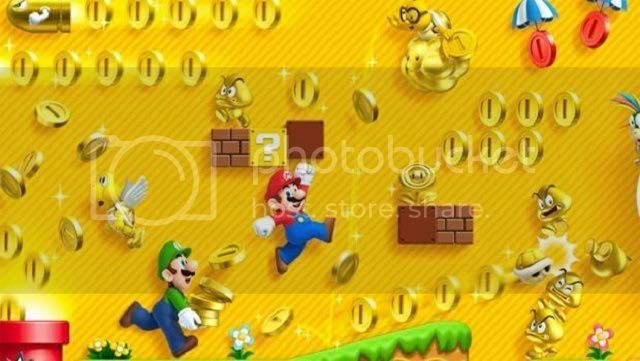 There's also the question of whether it's right for Coin Rush to have such a strong effect on the level design of what is, ostensibly anyway, a main series Super Mario Bros game. In the end, a gamer expects a top drawer platforming experience from Mario, and this focus on coins sort of obscures that. Of course, I understand the marketing reasons behind calling this New Super Mario Bros 2 rather than, say, Mario Coin Rush. The title alone might sell millions of extra copies of the game. But now we have to remind ourselves that this isn't a spin-off game. It's a sacred 2D Mario platformer, and that encourages us to evaluate the game based on what we expect out of a sacred 2D Mario platformer - a set of criteria that make NSMB2 look fairly mediocre. That's fair criticism, in the end, especially coupled with yet another trawl through the boring NSMB art and music style. Fair to a degree, anyway. I will say that gamers who are overly focused on the repeated assets are perhaps missing how risky parts of NSMB2 really are. A few of the professional reviews I've read said they explicitly ignored and/or resented the coin collection aspects of NSMB2. That's asinine. It's the most important new feature of the game and the one thing NSMB2 really brings to the Mario universe. If you ignore that, you're just setting yourself up for misery. For everyone else, NSMB2 does enough exciting new things that I feel it's worth recommending strongly. Still, this could have been a universally adored release if Nintendo would have just updated the look and feel. That's the most obvious thing that holds the game back. If NSMB2 goes down as a misfire, Nintendo brought it on themselves. Good review. Did the discussion in chat spur you to write this? I was actually halfway through writing this before we talked in chat, but you did bring up some good points that I tried to address. Having just fully completed all nine worlds (all star coins, all secret exits, all stages) and dabbled in Coin Rush a few times, I agree with just about everything. But I wouldn't say it's mediocre, even by Super Mario's ludicrous standards. I actually just played through NSMB Wii a few weeks ago, for the first time since it launched. It was still awesome, topped only by World in my book. And NSMB2 really wasn't much worse than that game. The powerups are a step down, to be sure. I really liked some of the motion-control level design gimmicks in the Wii game as well. And the awesome four-man couch multiplayer certainly beats two-player co-op that requires two systems and two copies of the game. But NSMB2 is no slouch, otherwise. Bit of a sidenote, but I don't think Mario has really gotten all that much easier. The physics are more forgiving, powerups are way more helpful, and enemies like Bowser and those GODDAMN HAMMER BROS have been toned way down, but the complexity of the NEW games makes them a lot more intimidating than you'd think. I played a bit of New Wii with two friends of mine -- a Non-Gamer Guy and PC Gamer Guy -- and they just couldn't finish the first World. PC Guy is a champ at strategy games and does well enough in action and shooters, but the moving parts and lava were just too much for him. 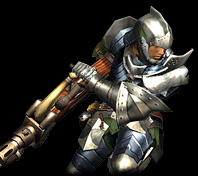 Non-Gamer couldn't pass anything that required running, a skill that becomes paramount much earlier in the NEW games than in the original. Heck, Ninja Gaiden Sigma 2 came more naturally to him than NSMB Wii. I think we'd all like to see tougher stages, but it's easy to forget that we're videogame acrobats who have been doing this all our lives. Mario's still pretty damn intimidating to newbies. Nice review--kept me on the edge of my seat the whole time! NSMB2 is definitely an odd one, a mix of awesome and disappointing that makes reviewing it kind of a self-conflicting task. It's like I'm sick of the generic look/sound but enjoy the level design but it plays it safe but Coin Rush is great fun but Coin Rush is flawed...so many mixed emotions! But that said, I keep coming back to it for the good times, so your thoughts are probably going to closely mirror my own once I get through all the stages. I agree about 1-A as well--that's one of my favorite levels after doing it over and over in Coin Rush! I think you and I have a similar route through the stage too (hit the halfway point, then go down the side to where the Gold Rings are, then go up and backtrack to get the 1UP, etc). That's a fair point, and really a tough question to answer - how easy is too easy and how hard is too hard? My wife threw a graduation party for a girl at her work, last year, and they played a bit of the original Super Mario Bros. These were teenagers who've had access to video games all their lives, and they could barely get past World 1-1. I sometimes forget that Mario skills have to be earned. They aren't issued to you at birth. Excellent review that mirrors how I feel on the game right down to the StreetPass features (I actually think I only have 7 StreetPasses as well ). But I do wonder how serious Nintendo will be about DLC for this game. They said they'd wait and see what people think (from an Iwata Asks) and then work their DLC for the game around that. I wonder if they could implement totally new features such as online leaderboards and if not, how extensive can these additions be? If it's simply remixing the order of levels we currently have, then that's pretty lame. Entire new levels would be great but then we have to delete our previous records to share it with the StreetPass feature (another fail). It's one game where I'm looking forward to its DLC and if Nintendo does it right or not. Nice review Kris! 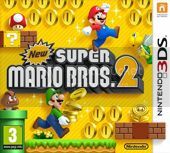 It seems like a fun game, but with other things to buy (both in and outside the gaming world), NSMB2 is unfortunately taking a back seat for me. Time will tell if I ever grab it for a lower price somewhere used. I actually really do like that high score mechanics of the game - but as a modern, high score based affair, I think there are certain expectations about leaderboards, both globally and amongst friends. It sounds like they could've done way better in that department. As a point of reference, looking at Pac-Man Championship DX, the leaderboards are almost overwhelming. SO many challenges. One minute runs. 10 Minute runs. Different ways of using the same level but in interesting ways. Preset challenges. Perhaps, outside the main game, they could've focused on 10 levels designed specifically for Coin Rush, and then provided pretty detailed leaderboards for all of them. Perhaps the DLC levels will better realize the coin collecting, but I think without that backend of stat tracking, the coin collecting will probably lose its luster for many people sooner than it should. Definitely looks like there's a lot to like about the game though. If I had more funds I probably would've grabbed it in a heartbeat. Good gravy that's a lot of text to read. Oh, it's good content, lazy-buns! Get to it. I'm not in the mood to read a novel. Just get to the point already. Scrolled down about 1,000,000 words, 8.5....got it. Very nice review, Kris! I'm glad our discussion yesterday helped with making it. Also, guys, big posts aren't necessarily boring! Reading all this was rather interesting and Kriswright does point out some interesting things. Do recommend getting to it. Also, I cringe whenever I hear a particular song (they're all pretty horrendous after awhile). It's just...not good. A Kriswright 8.5 has no context without reading it. You're kinda dismissing his whole thread and him, himself, with that comment. The point is that he wasn't writing to end up with a score. He was writing to tell us how he feels about the game, and in a review that represents the site mind you. Long? I figure this was a short one compared to my usual article length. I could have made it twice as long, easy. Seriously, though, I respect that not everyone will want to put the time in to read any particular thing I write. Fair enough. But this TL;DR comment stuff strikes me as the sort of thing most of us came to Negative World to not have to put up with anymore. But this TL;DR comment stuff strikes me as the sort of thing most of us came to Negative World to not have to put up with anymore. Fun review! Kept me on the edge of my seat the whole time. Don't worry Kris. We still appreciate you . You have become a right bundle of joy lately, did you hit 50 or something? One day I will find out how you became so enlightened. Oh come on, that wasn't even necessary. If you don't like it, move on. Kris has proven himself worthy of writing long posts on more than one occasion anyway.